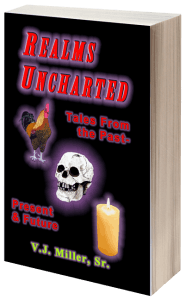 Realms Uncharted is an anthology of 13 of my short stories, and novellas that recount tales of Fantasy, Science Fiction, Thrillers, the Occult, and slices of life, here on Earth, and in other realities. From barbarians rampaging in long ago, arid wastelands to a chase by a Bounty Hunter across a far galaxy to bring a relentless Assassin to justice; from murderous revenge on a man in the wrong place at the wrong time, to near interstellar war over, of all things, chocolate. These are the tales from the Past, Present & Future. Action, mirth, abject fear; all are covered to great extent, and the endings will often surprise, or simply raise an eyebrow, but none will ever disappoint.